The Association of Public and Land-grant Universities (APLU) named Wayne State University the winner of its 2018 Project Degree Completion Award during its annual meeting in New Orleans. The annual Project Degree Completion Award identifies and honors institutions using innovative strategies or programs to increase retention and graduation outcomes and decrease achievement gaps. To markedly boost graduation rates, Wayne State launched a Student Retention Initiative in 2011, investing more than $10 million in student success over the following five years. Wayne State’s Student Success Initiative improved student success by hiring professional academic advisors, improving curriculum in general education courses, increasing support for faculty teaching development, bolstering support for underprepared students, establishing first-year experiences for new students and strengthening financial aid. Wayne State has increased its commitment to low-income and first-generation students through a robust suite of awards and programs, including a first-generation fee waiver and the Wayne ACCESS Award, which covers the full cost of tuition and fees. The university also created the Warrior Way Back Program, an innovative debt forgiveness program designed to re-engage adult learners who cannot return to college because of past-due balances. The comprehensive approach to student success has yielded remarkable gains, with Wayne State’s graduation rate nearly doubling in six years, increasing from 26 to 47 percent. Gains have been particularly pronounced among first-generation, low-income and minority students. Wayne State plans to further build on its progress. The university — which welcomed the largest freshman class in its 150-year history this fall — is planning new efforts to further reduce educational disparities and improve graduation rates. An independent panel of eight judges reviewed this year’s Project Degree Completion Award applications and voted Wayne State University as the winner after a thorough review and interview process. Other finalists included: Arizona State University; the University of Memphis; the University of Nevada, Reno; and the University of Rhode Island. 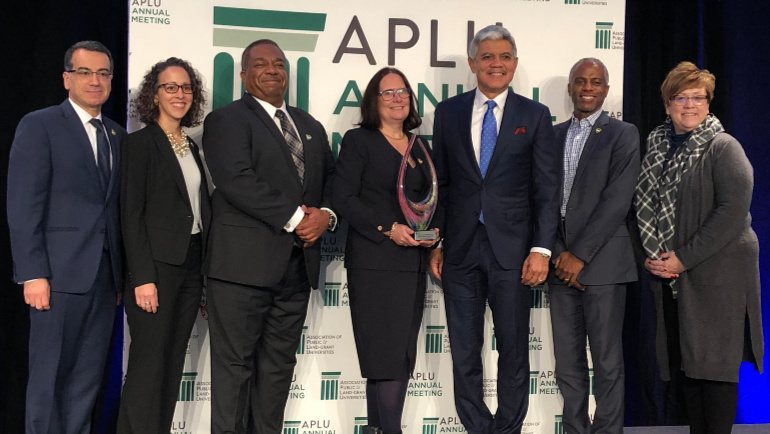 The award, which was open to all APLU member institutions, is designed to share innovative practices with other public universities and encourage other institutions to draw from those successes. It is one part of Project Degree Completion, a joint initiative that APLU and the American Association of State Colleges and Universities developed in which nearly 500 public colleges and universities pledged to collectively award 3.8 million more bachelor’s degrees between 2012 and 2025. Past winners of the APLU Degree Completion Award and previous iterations of the honor include: the University of Hawai‘i at Mānoa (2017); University of California, Riverside (2016); Morgan State University (2015); University of Tennessee, Knoxville (2014); Florida State University (2014); Georgia State University (2013); and San Francisco State University (2013).